Imagine a young woman, engaged to be married. Her mind is occupied with a long to-do list that includes preparations for the wedding, and for the new home she’ll create with her husband. Husband. Just thinking about him sends her mind floating to dreams for the future. And all her plans and dreams rise and fall over hills of emotion: great excitement in the new adventure to come, yet melancholy, too, because life-as-it’s-always-been will soon be no more. Surely Mary, the mother of Jesus, must have been thinking similar thoughts as she planned and prepared for her wedding and married life, just like any other bride. Now imagine her surprise when the angel, Gabriel, appeared to her. The Bible tells us that as Gabriel spoke, Mary was greatly troubled (Luke 1:19). I like Eugene Peterson’s choice of words: “She was thoroughly shaken” (The Message). Do you suppose Mary jumped at the sound of his voice? Did her eyes grew wide and her hand clap over her mouth? Might she have taken in a quick gasp of air as her heart began to pound? Gabriel hurried on to explain God’s plan for her—so radically different from the plans she and Joseph were making. Mary was no doubt envisioning a small wedding (after all, they were not wealthy), and settling down to a quiet life in Nazareth. Little did she know that a trip to Bethlehem was in her future—during her ninth month of pregnancy no less. Mary had been chosen by God to bear the Messiah! The Jews had been waiting centuries for this event. God could have chosen any time or any place for the birth of his Son. He could have named any woman to be the mother of Jesus. He chose Mary, a small-village girl. No wealth, no sophistication, no influence. Did Mary’s cheeks burn with modesty, to be selected for such a monumental privilege? Yet the magnitude of this honor quickly gave way to practical matters. She asked Gabriel, “How will this be, since I am a virgin” (v. 34)? Gabriel explained as best he could. I wonder if God the Father had given him explicit instructions about what to say. After all, he was trying to explain cosmic, miraculous, humanly impossible events. And Mary stood on the precipice of eternity, facing a decision with eternal consequences. Which way would she choose? She could have said, “Oh, no, Sir. This cannot be. I am not qualified. Such a responsibility is much too frightening even to consider! Please choose someone else.” A very logical answer, right? But instead, Mary responded, “I am the Lord’s servant. May it be to me as you have said” (v. 38). Perhaps it was Gabriel’s last words that gave her such boldness. “For nothing is impossible with God” (v. 37). Did the numerous miracles of the Old Testament whisk through her mind, as proof of Gabriel’s words? 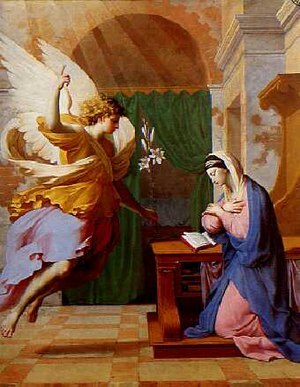 Might it be, as Gabriel began to relate what would happen, that the Holy Spirit came upon her right then? And the power of the Most High overshadowed her (v. 35) even as Gabriel spoke? Perhaps, at that very moment, the presence and empowerment of God rushed into Mary’s mind and heart. In her defining moment, young Mary exemplified the epitome of innocent trust in God and unfaltering obedience. Oh, Father, I want to trust you with pure abandon, just as Mary did. Too often I fret about consequences. I want to live out your plan, in the place you have chosen, at the selected time, just as Mary did. Too often I’m in a hurry and want things to happen here and now. And like Mary, I want to stand strong on the edge of eternity, with my arms spread wide, and jump into the abyss of your plan—confident in the knowledge that you will carry me on eagles’ wings (Exodus 19:4). I am the Lord’s servant. May we all chose that answer when He calls. Great post. You got me right in the moment with Mary. What a wonderful adventure when we do that. Your prayer is mine, also. There is peace in the center of our Father’s will. How much do we miss out on for lack of trust. Amen, sweet cousin! Your last statement would make a good “prompt” for another post. If I’m mindful of what I’ll miss for lack trust, perhaps I’ll make better choices! Thank you for visiting my blog, and may the blessings of Christmas fill your hearts with warmth and joy–the way it should for a special couple like you two! I’m not sure that I’ve ever put myself in Mary’s place… What faith she had in God! Even with a practical mind…she chose to trust, becoming the instrument of God’s Plan.